VPS-Server Review 2019: Is VPS-Server a Good Hosting? VPS-Server offers website hosting on a low-cost global server network. Its shared hosting plans offer good value relative to the competition, but e-commerce merchants looking for VPS hosting will find the value undermined by processing power that doesn’t match the data storage capabilities. VPS-Server is a Russian web hosting company with 10 years of experience. It offers website hosting on a low-cost global server network encompassing the US, France, Holland, Germany, and Russia. 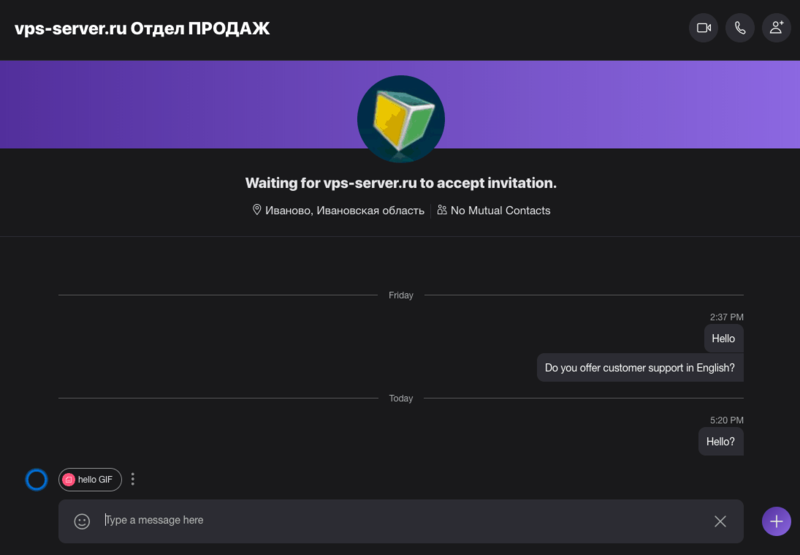 Support is apparently provided only in Russian, but VPS-Server’s website can be switched between Russian and English. The most standout feature of VPS-Server’s web hosting plans is the geographic coverage of its servers. Webmasters running sophisticated e-commerce stores with a global presence can use a single provider for access to servers in the US, Europe, and Russia. One web hosting plan includes an SSL certificate, but a certificate must be purchased for all other plans. You get no free domain, and backups must be purchased separately. Deep down in this vendor’s terms and conditions is a service level guarantee for 99% uptime. The VPS-Server website indicates that it is “Easy to create and release your site with popular CMS: Drupal, Joomla, WordPress,” and further implies “Easy CMS installation,” which I take to mean some kind of one-click installer. Similarly, a website builder is implied but is not spelled out in any detail. A “convenient” control panel is provided, but I don’t know which one. Backups come with FTP and Rsync access, but must be purchased separately. Not for the first time, you have to dig very deep into the terms and conditions to find this, but all VPS-Server hosting plans come with the right to cancel the plan at any time and receive a refund for unused services. However, refunds are only given for remaining whole months, and all come with a 10% return fee. The entry-level shared hosting plan comes with the ability to host five sites, which makes it more expensive relative to other providers’ plans that allow you to host a single site. Unless you really do want to host five sites, of course. Every plan comes with unlimited MySQL and FTP accounts, and the highest-tier plan comes with enough disk space for all but the largest sites. The prices for the higher-tier plans are excellent compared with what you can get elsewhere. Confusingly, plans with higher disk space don’t come with SSL certificates, so for your e-commerce store, you will have to choose between buying an SSL certificate (for a high storage plan) and paying for additional storage (on a plan that includes an SSL certificate). There are several SSD-based Linux VPS hosting plans that all come with the same features but different resource allocations of 1 or 2 CPU cores, 1 GB to 4 GB RAM, and 30 GB to 100 GB disk storage space. There are also some HDD-based VPS hosting plans with higher RAM and storage allocations but still only 1 o 2 CPU cores. Unfortunately, I feel that the lack of sufficient CPU cores and memory for the amount of data offered will make it nearly impossible to maintain speeds. The Windows VPS plans are more attractive than the Linux plans. They include 2 to 8 CPU cores, 2 GB to 8 GB RAM, and 160 GB of disk space. However, they also come with traffic limits of 6 TB to 8 TB before additional capacity must be purchased, so webmasters who run large sites should be sure of their traffic needs before signing up. The “VPS for Startups” plans are best avoided altogether since (for the price) they offer too little memory to handle the amount of disk space. There is a fairly extensive self-help database, but it is in the Russian language only. With servers in the U.S., Europe, and Russia, VPS-Server offers excellent geographic coverage for e-commerce merchants. However, the value of the VPS hosting plans is undermined by a pricing scheme that doesn’t do a good job of matching power with storage capacities. Advanced webmasters can take a look, but be sure about your needs before signing up. Wondering how VPS-Server stacks up against other Web Hosting companies? Enter any other Web Hosting company and we will give you a side-by-side comparison.